Ultrasonic testing (UT) is a form of non-destructive testing (NDT) that uses high-frequency sound waves to measure the thickness or hardness of a material. Ultrasonic tests often are performed to assess corrosion on pipes, valves and steel or aluminum constructions. An ultrasonic tester also is used to detect flaws such as cracks and leaks. Thus, an ultrasonic tester is an integral tool used in material testing and engineering, manufacturing quality control, equipment condition monitoring, building and bridge inspection and more. PCE Instruments offers accurate, affordable ultrasonic test equipment for the non-destructive evaluation (NDE) of ferrous and non-ferrous metals and alloys, plastics, composites and ceramics as well as for the non-destructive inspection (NDI) of industrial welds and building walls. If you have any questions, please contact us at or +44 (0) 2380 987 035 for PCE Instruments UK or or +1 (561) 320-9162 for PCE Americas Inc.
PCE-TG 50 is a compact ultrasonic thickness tester or gauge used to measure the thickness of metal, glass, plastic and other homogeneous materials. This portable handheld material thickness gauge operates with an external ultrasonic contact transducer sensor probe and requires the use of coupling gel or paste. The PCE-TG 100 is a compact ultrasonic thickness tester for homogeneous materials. This ultrasonic thickness tester PCE-TG 100 works with an external ultrasonic probe; this probe conducts ultrasonic waves into the material to be tested. Different materials conduct ultrasound at different speeds, so you can choose different ultrasonic speeds on the PCE-TG 100 Ultrasonic Thickness Tester. The Ultrasonic Thickness Tester PCE-TG120 is a very easy-to-use wall thickness gauge for all materials. This ultrasonic thickness tester works to accurately measure the material thickness / wall thickness with ultrasound. The Ultrasonic Thickness Tester PCE-TG 110 is a thickness gauge with external high-temperature probe for ferrous and non-ferrous metals etc. The PCE-TG 110 is an ideal ultrasonic thickness tester for water pipes, steam pipes and pipes for chemicals. PCE-TG 250 is a portable Ultrasonic Thickness Tester with an easy-to-read 4-digit display. This ultrasound-based Thickness Tester uses a contact transducer (included) to measure the thickness of coated and uncoated ferrous and non-ferrous metal, glass, plastic, and other homogeneous materials including aluminum, brass, copper, iron, lead, nickel, steel, gold, titanium, pyrex and quartz glass, nylon, polyethylene, and silicone rubber. PCE-TDS 100H is a portable handheld clamp-on ultrasonic flow tester or meter used for non-invasive, unobstructed and highly accurate measurements of the flow velocity of liquids in metal, plastic and rubber pipes and tubes with a diameter of 57 … 720 mm / approx. 2 ... 28 in. Software sold separately - see accessories for details. PCE-TDS 100HS is a portable handheld clamp-on ultrasonic flow tester or meter used for non-invasive, unobstructed and highly accurate measurements of the flow velocity of liquids in metal, plastic and rubber pipes and tubes with a diameter of 20 … 108 mm / approx. 3/4 ... 4in. Software sold separately - see accessories for details. 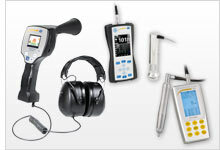 The ultrasonic tester leak detector PCE-LDC 10 is used in a wide range of industries. For example, the ultrasonic leak detector can help identify leaks in compressed air, gas, steam, vacuum and refrigeration systems as well as around door seals. The noise-cancelling headphones of the ultrasonic leak detector ensure that the device can be used successfully even in noisy environments. PCE-TDS 100HSH is a portable handheld clamp-on ultrasonic flow tester kit used for non-invasive, unobstructed and highly accurate measurements of the flow velocity of liquids in metal, plastic and rubber pipes and tubes with a diameter of 20 … 720 mm / approx. 3/4" ... 28". Software sold separately - see accessories for details. The UCI ultrasonic tester PCE-3000U can be used for quickly checking the hardness of components even after installation. The device offers a wide measurement range, easy handling, robust design and a temperature resistance up to 40 °C or 104 °F. In addition to the hardness scales in Rockwell, Brinell and Vickers, the UCI ultrasonic tester can test the tensile strength of steels up to 1740 MPa or 70 HRC. The UCI hardness tester PCE-3000UL can be used for quickly checking the hardness of components even after installation, two probes are included. The device offers a wide measurement range, easy handling, robust design, and a temperature resistance up to 40 °C (104 °F). Measures hardness in Rockwell, Brinell and Vickers, the UCI hardness tester can test the tensile strength of steels up to 1740 MPa or 70 HRC. The tester comes with two probes, one UCI probe for non-destructive testing and one Leeb probe for rebound testing. The Ultrasonic Contact Impedance (UCI) durometer PCE-3500 has been designed for the non-destructive hardness measurement of metallic components. A 136° Vickers diamond at the probe is stimulated with its self-resonance to allow the user to very accurately measure hardness of small items, thin-walled items (>1 mm), and surface-hardened layers. Small imprint after measuring for mirrored surfaces. The Ultrasonic Contact Impedance (UCI) durometer PCE-3500 has been designed for the non-destructive hardness measurement of metallic components. A 136° Vickers diamond at the probe is stimulated with its self-resonance to allow the user to very accurately measure hardness of small items, thin-walled items (>1 mm), and surface-hardened layers. Small imprint after measuring for mirrored surfaces and nitrided surfaces. PCE-FD 20 is a portable ultrasonic thickness tester or ultrasonic thickness gauge with a large LCD screen that displays A-scan maps of ultrasonic signals as well as B-scan cross sections. Ideal for use in mechanical engineering, aerospace and metallurgical applications, this high-frequency ultrasound-based thickness meter uses a contact transducer (two different probes included; 45° and 90°) to measure material thickness and identify flaws and defects such as discontinuity in welds. PCE-5000 is a portable hardness tester that uses the ASTM A1038 ultrasonic contact impedance (UCI) method to measure the hardness of metals and alloys with a minimum thickness of 2 mm / .08 in. Non-destructive testing produces microscopic indentation. PCE-USC 20 is a portable or benchtop ultrasonic thickness tester or ultrasonic thickness gauge with a 5.7" TFT color LCD screen. This ultrasound-based thickness meter uses one or two contact transducers (four different probes included; 90 °, 70 °, 60 °, 45 °) to measure material or wall thickness, detect flaws or defects in welds, and monitor the effects of corrosion on pipes and tanks. A portable ultrasonic tester or ultrasonic gauge is an incredibly versatile measuring device that comes in handy in myriad applications, especially when detecting leaks or measuring the effects of corrosion on tanks, pipes and structures with limited one-sided access. In addition, an ultrasonic thickness gauge can be used to determine the thickness of coated or painted metals without the need for stripping. Another kind of ultrasonic testing device is an ultrasonic contact impedance (UCI) durometer or hardness tester. A UCI hardness tester is a portable electronic device that uses the UCI method of hardness testing standardized by ASTM A 1038 and DIN 50159. A UCI hardness tester makes and then measures a diamond indent in the surface of material to determine the material hardness.